Nothing is tastier and healthier than Tex-Mex food from family-run taquerias and restaurants in the Florida citrus areas and in our border states of Arizona, New Mexico, Texas and California. In the best places, the music is Latin, the newspapers are in Spanish, and the owners and customers are Hispanic. See the photo of chcken the Chicken Enchelada dinner I enjoyed at Rosita's in Florida City. Buen Provecho! Bake for about 25 minutes. Pan can be covered or uncovered; it works both ways. Best choice for health is a corn taco. But if you deep-fry either type of tortilla i.e. flour or corn, they'll both come up loaded with grease and calories. So go for the "soft" taco option whenever you can. When dining out Mexican, you inevitably end up face-to-face with a basket of tempting tortilla chips. If you can enjoy one big handful of chips and then hold off until your meal comes, you'll add about 140 calories (with about half the calories coming from fat). So if you can't stop at a handful, you might want to move that basket to the table next to you. When you're serving Tex-Mex at home, skip the chips in favor of a crunchy platter of crudites, or have a reasonable portion of the baked version. Source: WebMD http://www.medicinenet.com/script/main/art.asp?articlekey=56075&page=2 Published April 7, 2005. Steam-heat 10 or 12 corn tortillas; shred about 1 1/4 cups of cooked chicken into a skillet and warm with a moistening of the sauce. Roll a portion of the filling into each tortilla, lay them in a baking dish, douse with more of the hot sauce and sprinkle with about 1 1/2 cups of grated Chihuahua or other melting cheese. Broil until browned and bubbly, then serve topped with rings of white onion. Tomatillos are wonderfully adaptable. Sure, any dish that employs them for sauciness will showcase their lovely, earthy-green tartness. But depending on which steps of preparation are chosen, what balance of flavors in the dish and what variety is at hand, tomatillos can contribute a wide range of flavors. This simmered sauce is the perfect example of the tomatillo's congeniality. For a light (both in color and flavor), bright sauce that's great for fish or enchiladas, I've given directions for barely boiling the tomatillos during the first stage of preparation. For a rich, more complex sauce that I love with beef or lamb, there are directions for roasting the tomatillos first. A thorough frying of the tomatillo puree mellows the tartness by concentrating the sweetness. The richer-flavored the broth (meat broth being the richest in flavor), the more genial the sauce. And, if it seems appropriate for your finished dish, incorporating practically any dairy product (from yogurt or cream in the sauce, to fresh, aged or melted cheese over the dish), offers even more balance. The roasting method: Lay the tomatillos and chiles on a baking sheet and place about 4 inches below a very hot broiler. When the tomatillos and chiles blister, blacken and soften on one side, about 5 minutes, turn them over and roast the other side. The boiling method: Half fill a medium (2- to 3-quart) saucepan with water, salt generously and bring to a boil. Add the tomatillos and chiles and simmer vigorously over medium heat until the tomatillos have softened a little and lost their brightness everywhere except on the indented stem end, 2 to 4 minutes. Drain and cool. Transfer tomatillos, chiles and any accumulated juices to a food processor or blender. 2. The puree. Heat 1 tablespoon of the oil in a deep, medium-large (9- or 10-inch) heavy skillet over medium. Add the onion and cook, stirring often, until deep golden, about 8 minutes. Stir in the garlic and cook a minute longer, then scrape the browned mixture into the processor or blender. If using a blender, cover it loosely. Now, pulse whatever machine you're using to reduce the ingredients to a rough-looking puree smooth enough to hold together, but rough enough to keep it from that uninteresting baby-food blahness. 3. Finishing the sauce. Wipe the skillet clean; then heat the remaining 1/2 tablespoon of the oil over medium-high. When hot enough to make a drop of the puree sizzle sharply, pour it in all at once and stir constantly for 4 or 5 minutes, as your sauce base sears and sizzles into a darker and thicker mass. (You'll notice that characteristic roasty, tangy aroma fill the kitchen.) Stir in the broth, let return to a boil, reduce the heat to medium and simmer briskly until thick enough to coat a spoon, about 10 minutes. (You can check the consistency by spooning a little on a plate: If it looks watery, solids separating quickly from the broth, simmer it longer; if it mounds thickly, stir in a little broth or water.) Stir in cilantro, then taste and season with salt. Advance Preparation  The sauce can be prepared 4 or 5 days ahead. If frozen, whiz it in the blender or processor to get it back to a beautiful texture. Other Chiles You Can Use  Fresh jalapeños can stand in for the serranos. Stir together the crema and milk in a small mixing bowl. lightly salt and set side. In a medium saucepan or deeper skillet, melt the butter with the 2 Tbl. oil over medium heat. Add the garlic and green onions and cook about 2 minutes, until the onions are softened. Add the crabmeat, chile strips and 1 c. of the thinned crema, reserving the rest to use as a topping. Lower the heat and continue cooking for 5 to 8 minutes, stirring very gently. Add pepper to taste. This can be prepared to this point ahead of time and then reheated. Warm the 1/4 c. oil in a skillet. Press each tortilla into the hot oil with a spatula until they just soften, a few seconds at most. Drain tortillas on paper towels. Continue until all the tortillas are cooked. Place an equal amount of filling across the center of each tortilla. Roll them up and put them side by side in a lightly greased baking dish. Pour the remaining sauce over the top, and sprinkle the grated cheese over the top. Cover pan with aluminum foil and bake for 15 minutes or until thoroughly heated through. Serve immediately, garnished with chopped cilantro and sliced white onion tops. Serving suggestion: lots of fresh lettuce, tomatoes, and any other toppings you enjoy. with 1/4 teaspoon of water. Heat for up 45-60 seconds. Roll immediately. A great recipe! Let's Dish chef Chris Koetke shows how to make fresh salsa verde sauce with tomatillos and then put it all together for delicious enchiladas. Looks like a good recipe to make for a crowd. Make the Salsa Verde first. Click on image for link to video to see how easy it is to make it in a blender. Roast poblano peppers in a 425 degree oven for approximately 10-15 minutes or until skin is browned and bubbling. Place them in a bowl and cover with plastic wrap so that they steam. About 30 minutes later, remove skin and seeds. Slice thinly. Heat oil in a pan. Saute sliced onion until translucent. Mix in sliced poblano peppers, thyme, salt, and oregano. Saute for another 3 minutes, remove from heat, and reserve. Put 1/2 cup salsa in the bottom of a 9 x 13" baking dish. Heat tortillas in microwave until warm, about 10 seconds (do about 4 at a time). Place 1 cup salsa in a shallow bowl. Dip tortilla in salsa. Fill tortillas with shredded chicken, half of the cheese, and half of the poblano/onion mixture and roll up. Place rolled tortillas, seam side down, in the baking dish. Cover with the remaining salsa. Spread remaining poblano/onion mixture on top of the enchiladas. 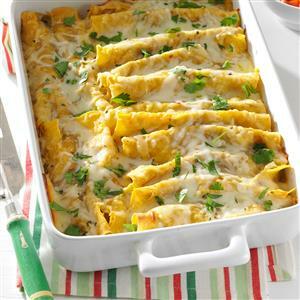 Sprinkle the rest of the shredded cheese on top of enchiladas. Bake in a 350 degree oven until heated through and cheese has melted, approximately 30 minutes. NOTE: Use left-over chicken. If you use fresh chicken, simmer it in seasoned chicken broth until it is tender and cooked through. Heat oven to 400 degrees F. In a food processor, purée the salsa and cilantro until smooth. Add the sour cream and pulse to combine. Spread 1 cup of the salsa mixture in a 9- by 13-inch baking dish. Transfer the remaining mixture to a medium bowl. Heat the oil in a large skillet over medium heat. Add the garlic and cook, stirring, for about 1 minute. Add the zucchini and cook, tossing, for 1 minute. Stir in the coriander, chili powder, and 1 teaspoon salt; remove from heat. Add the chicken and 3/4 cup Muenster cheese and mix to combine. Wrap the tortillas in a double layer of damp paper towels; microwave on high until soft, about 1 minute (be careful of the steam when removing). Working with one tortilla at a time, dip in the reserved salsa mixture, shaking off any excess. Place on a cutting board, top with 1/2 cup of the filling, roll up, and place, seam-side down, in the baking dish. Repeat with the remaining tortillas and filling. Spoon any remaining salsa mixture on top. Sprinkle with the remaining 1/4 cup cheese and bake until the cheese begins to brown, 12 to 15 minutes. Serve with chopped onion and cilantro, if desired.